Are you thinking Valentines yet? I sure am…It’s the only holiday I have an excuse to decorate with pink! Today, I am taking part in a fun Valentines Blog Hop. Head over to Country Chic Cottage and see all the other bloggers participating…The series started Monday, so there are a lot of Awesome projects to check out! So, the theme is Valentines, but it is also supposed to be a 15 minute craft…If you know me, I can’t do any craft in 15 minutes! It is really a challenge for me to keep things simple. I just can’t leave a project alone. Here’s what I came up with…and it really can be created in 15 minutes! 1. Cut foam board to the size of the frame and cover with fabric. I chose a neutral burlap. I simply taped the burlap to the back of the foam board with duct tape. 2. Cut twine long enough to wrap to the back of the foam board just a bit then tape in place. 3. 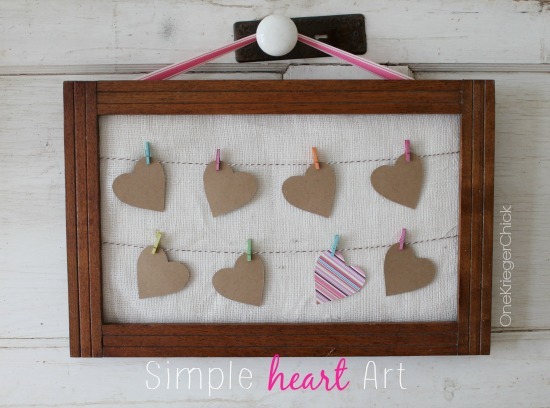 Clip Cut out hearts onto twine with clothespins. Note: I shopped my house for this project and did not purchase a thing. 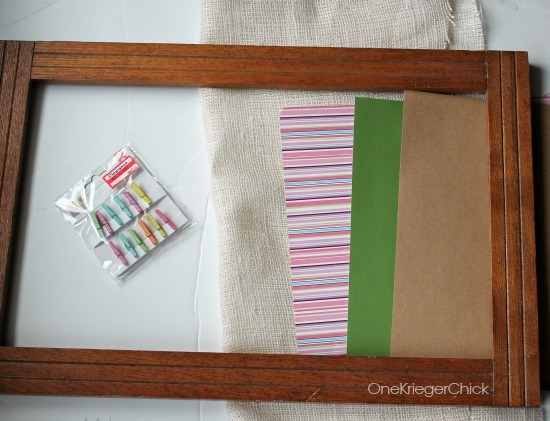 It’s a perfect way to use up small supplies or scraps! Make it your own! Thanks so much…It was SO easy to do! LOVE this Ariean! So pretty! This is absolutely adorable!! Thanks so much for participating! Thank you so much for including me…This was so much fun to be a part of! I’m so going to make this! I may throw in some pink, because like you, I’m the only girl in the house of boys! Oh you should…It’s so easy! Love to see what you come up with! This is one of those projects that is super simple… but doesn’t look like it took no time at all. Those are my favorites! Thanks for hosting such a fun series! I loved looking through all the other projects! Oh my, I love this! Simple, fun, and easy to update in the future! We’d love it if you came and linked up at Do Tell Tuesday (it’s live)–this is too fun not to share! Thanks so much Lisa! And thanks for the invite to your fun party! I love the simplicity with the cute pops of color! Great job! You are so sweet Ashley…Thank you! Looking forward to seeing what you are up to! I love this! So simple and cute – you did an amazing job!! Oh, Thank you so much! It was so easy to put together too! Thanks so much and Thanks for hosting the fun party!